We're proud to announce that it's now possible to restart already stopped sessions (history sessions) to continue working on a document. 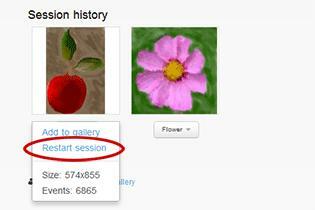 This new feature is available for all history session which were started from April 15th 2012 and it's visible to every registered Artweaver Team user after the next login. Notice We are sorry but for older session this feature is not possible / available. Just select Restart session from the new pop-up menu of a history session in the Web interface and enter a name for it. That's it! Everything else is the same as for new created sessions. After some seconds your new "old" sessions should be started and ready. If there are any open questions, check out the help pages or contact us. With the last update to Artweaver Team there are also some feature improvements in the web interface besides the visible changes in the design. 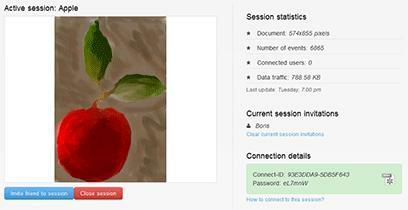 We're proud to announce that now a public gallery is available on Artweaver Team where all users can show their session results to everyone. 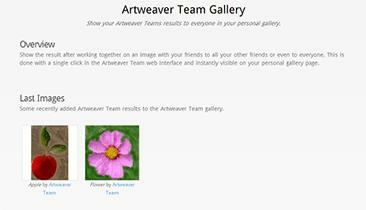 This new feature is for free and visible to every registered Artweaver Team user after the next login. The personal Artweaver Team gallery is accessible for everyone by entering an address like http://www.artweaverteam.com/gallery/Artweaver Team. A new image in the gallery is instantly visible on your personal gallery page with a single click in the Artweaver Team web interface. Just click on the Show button under the preview in the session history list after a session has been stopped. 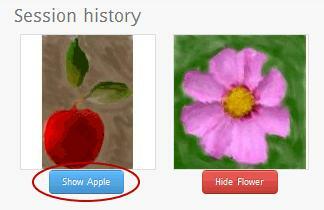 You can also enter a tittle and description of the image which is shown on your gallery page too. If there are any open questions, check out the help pages or contact us. Also don't miss to check out the latest images added to the Artweaver Team gallery on this page. The closed beta test for the next Artweaver major version has been finished and now you can enjoy the result. Artweaver Free and Plus, both in version 3.0, are now available incl. support for Artweaver Team. This also means that Artweaver Team is out of beta and available to everyone. If you still encounter an issue or there is a feature missing, please contact us. We are always open for new ideas... BTW you can get more information about the changes in Artweaver Plus 3.0 by visiting this page.